A twist on the traditional Colombian arepas recipe made with fresh ricotta cheese and spicy roasted vegetables. This Colombian Spicy Vegetable Arepas recipe has only 4 ingredients and is ready in 15 minutes, a simple new addition to your global weeknight meal recipe rotation! One of my favorite new-to-me foods from our recent trip to Colombia was arepas. Arepas are small fried corn cakes made from masa harina flour that are a staple dish throughout Colombia. Arepas are eaten plain as snacks, topped with cheese for breakfast, or loaded with vegetables and meat to round out a lunch or dinner meal. 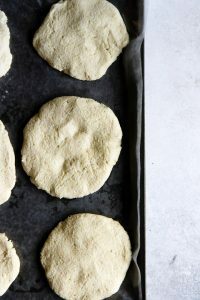 I knew from the first time we tried them at a small breakfast hut overlooking a large farming village in Colombia that I would be recreating a Colombian arepas recipe at home. And while arepas can be boiled, grilled, or fried, I kept this homemade Colombian Spicy Vegetable Arepas recipe light by pan frying in a small amount of oil and topping with fresh and flavorful spicy roasted vegetables. Arepas are corn cakes that are popular throughout Central and South America, particularly in countries like Colombia and Venezuela. Arepas are made from unleavened masa harina, with is a flour made from fine dried corn (also known as hominy) and is used to makes arepas, tortillas, tamales, empanadas, and papusas. How do you make arepas? Can arepas be made vegan? Arepas are simple to make and only require 4 ingredients. A simple, traditional Colombian arepas recipe includes masa harina flour, cheese, water, and salt. However arepas can easily be made vegan by omitting the cheese and will still retain their shape and deliciousness. Adding flax or vegan cheese would also be a great additions to vegan arepas. The corn flour, water, cheese (if you’re using it), and salt are mixed together into a dough and formed into small balls. The balls are then smashed into a cake and pan fried with a small amount of oil, or they can also be baked or fried. I found that the cakes were quite wet and therefore did well in a pan, but if you would like to grill arepas I would suggest reducing the amount of cheese and/or water used to have a drier cake that does not fall apart. 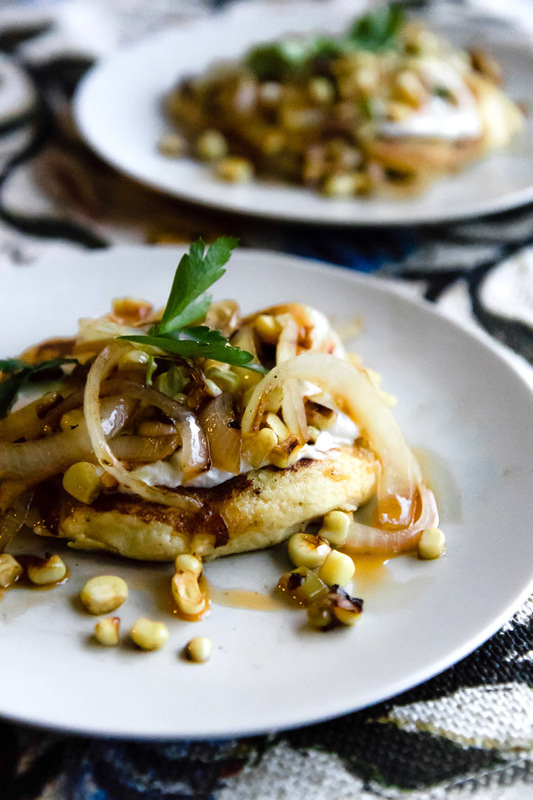 The possibilities are endless for this Colombian arepas recipe! 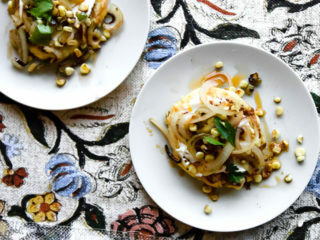 Below are a few arepas variation ideas to spice up your next weeknight dinner trip to Colombia. Make it an arepa sandwich: Arepas are often used similar to a pita pocket and filled with fresh veggies, meats, and salsas. Seafood arepas: Top areas with seafood and a spicy herbed mojo sauce. Simple and sweet: Keep it simple for breakfast or a snack with a bit of spreadable cheese and a drizzle of agave or wild honey. 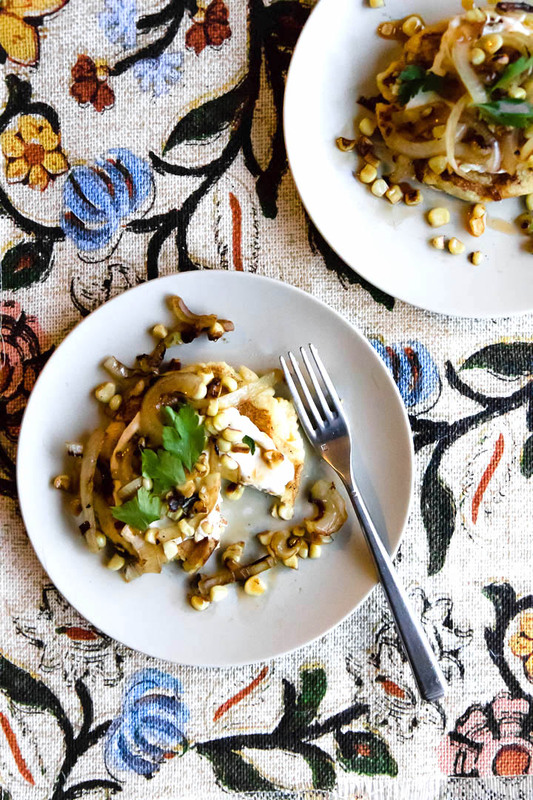 For this Colombian Spicy Vegetable Arepas recipe I recreated one of my favorite Colombian dishes by topping them with a soft, spreadable cheese (I used ricotta, but you can use any light cheese that spreads) and a mixture of roasted vegetables with cilantro and spices. This recipe is a perfect easy lunch or can be paired with rice, beans, vegetables for a full Colombian dinner experience. This Colombian Spicy Vegetable Arepas recipe is super easy to make, but there are a few products I would recommend. While regular cornmeal will work, a true traditional arepa is made with masa harina (not hard to find at most grocery stores with a good baking section). I also used one of my favorite ingredients of the moment, spicy chili oil, to add extra heat to the spicy vegetables–but this is completely optional. 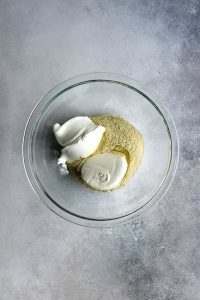 Other than a great pan and a bit of oil that is good for frying, this recipe for arepas is easy and won’t require extra tools. A twist on the traditional Colombian arepas recipe made with fresh ricotta cheese and spicy roasted vegetables. This arepas recipe is only 4 ingredients and is ready in 15 minutes, a simple new addition to your global weeknight meal recipe rotation. Combine masa harina flour, cheese, salt, and half of the water together in a large mixing bowl. Mix well and slowly add more water until the dough is formed and pliable but not too wet or it will be mushy after cooking. Heat oil in a large pan to medium-high heat. Form dough into small ⅓ cup size balls and then flatten into a cake. Cook arepas in oil until lightly crispy and golden, about 3-4 minutes each side. Top with a smear of ricotta cheese and Spicy Roasted Vegetables (recipe below). Heat oil in a medium frying pan. Add onion, bell peppers, chili pepper, and corn and cook until soft, about 5-6 minutes. Add salt and pepper and a small amount of chili oil (if using). Leftovers & Storage: Arepas can be stored in the refrigerator for 5-6 days and reheated. Tips & Make it Vegan: Using ricotta cheese in the arepas dough makes for softer arepas. If you like a drier and crispier texture, or would like to make the recipe vegan, eliminate the cheese and add a bit more water to the ensure the dough mixes completely before being cooked. Nutrition: The nutrition information provided is an estimate based on 1/4 of the recipe, which is one four-inch wide arepa with cheese and roasted vegetables. This Colombian Spicy Vegetable Arepas recipe is a good source of protein, is low in sodium, and is made from whole grain masa harina flour. Loving this Colombian Spicy Vegetable Arepas recipe? 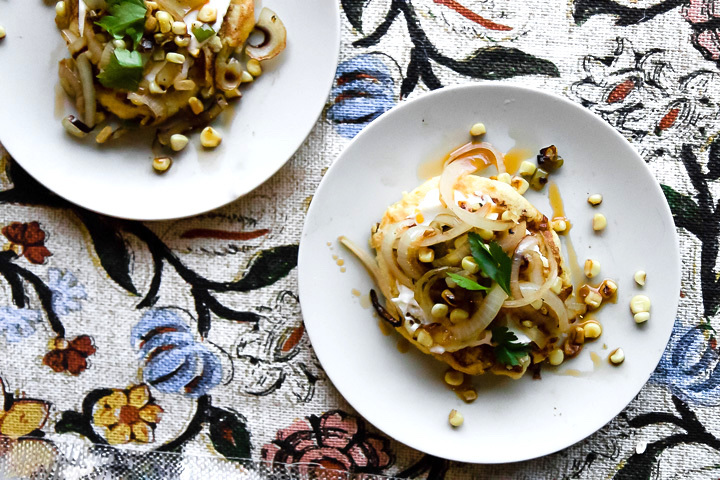 Try my other Colombian recipes, like this Healthy Baked Patacones with Mojo Sauce to bring a bit of Colombia into your next for dinner. Are you traveling to Colombia? Make sure to check out our favorite Bogota travel tips and restaurant recommendations! Did you make this recipe? Don’t forget to let us know! Leave a comment, rate the recipe, and tag your photo #FITRfood on Instagram! It was! Not only was the arepa delicious, but the chile-infused oil really took this next level. I’ve always wanted to know how to make arepas, and now I know how. I’ve only tried ones made with corn, so it’s great to see something different. These look so good! Yes, they were really simple and delicious. There are so many possibilities, you could make them with veggies, meats, fish, or plain with a bit of cheese. They even serve sweet arepas in Colombia, maybe that will be my next experiment! You make this look so easy! I’m not sure if I’ve tried arepas or not- but I might try making a batch soon. They sound delicious! They’re super simple and are a great “monotony breaker” from my normal weeknight meals. And the possibilities are endless! Thanks for sharing, I love learning about different cultures’ foods. In my research I saw there are many different variations of arepas throughout northern South America, southern Central America, and in the Caribbean. Such a delicious blend of cultures, I’ll have to try Panamanian tortillas next! These look amazing. I’ve never tried arepas before but they look delicious. They are going on my meal plan next week! They are super easy and a great base for vegetables, meats, cheese, and even plain. I highly recommend! That looks delicious!! Why it’s almost like a flatbread. It looks like it would be very versatile. I’m definitely going to have to try this recipe out. Yes, it is very similar to a flatbread. Or naan, or a tortilla. It’s interesting how each culture has a similar, but unique, dish. Love the toppings on these! They would make a wonderful lunch or easy weeknight dinner! I love arepas and combined with the peppers.. perfect meal!! What a beautiful dish and I really like that you added the different ways to customize the arepas. Such a versatile food!! Super versatile, they’re a great staple and can be eaten savory or sweet. Thanks for stopping by! I didn’t even know what Arepas were. Now, I think I have to try and make these! I didn’t know what they were either until my trip to Colombia and now they’re a fav dinner recipe on repeat. Very easy to make and really versatile. I. LOVE. AREPAS. I can’t believe I’ve never tried making them at home. It’s official… you’ve inspired me. Haha, I’m a new arepa-lover myself. I’m glad I inspired you! What a great recipe to find! I have a rather large bag of masa harina in the pantry from another recipe I’d made and have been looking for more dishes to make with it. These arepas look and sound fantastic and I’ll definitely be trying the recipe next weekend! That’s great! Yes, they’re super simple. If you want them a little drier then try without the ricotta cheese. Both are great though, and very easy to make. Ooh. thanks for posting this recipe, I had an arepa sandwich once and loved it so. Now I can make it at home! Thanks so much! I loved them in Colombia and couldn’t get them off of my mind, so I had to recreate at home! What a fun combination of flavors! I can’t wait to try making this! I can’t resist a corn cake with a bit of spice! These look awesome! I always think about getting masa and trying this, but now I really NEED to! Yes, they’re super easy and so versatile. A new staple dish in our house! I’d never heard of arepas before! They sound so tasty! Thanks for giving info on how to make them vegan as well! Yes, super easy to make vegan. And so versatile! I either need to make arepas at home or maybe I need to go to Colombia… maybe both?! Love this! I hadn’t ever heard of these before! I love arepas! My sis in law is from Colombia and we so enjoy it when she makes these! That’s great! I need a Colombian sister in law so she can teach me how to cook delicious Colombian food. Love that these can be made vegan, your pictures are stunning, am so excited to add this to my recipe box! That’s so good to hear! I always try to include a vegan option for my recipes and with arepas I often make them vegan for myself as well. I’m all about recipes that are flexible.